In business or in public service, there are certain rare individuals, "stars", whose enthusiasm, skill and effort shine a light for others to follow. 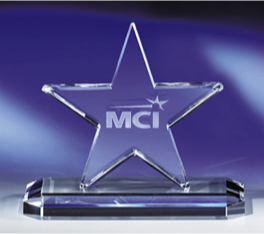 "Star" a handsome crystal award from CRYSTAL WORLD, will make an ideal incentive gift or award for these rising stars. Perfectly cut and shaped to capture and refract light, "Star" features a generous center area for etching. Base is included. Comes in 2 sizes. 5 1/4" x 3 1/8" x 4 1/2"